World Championship Decks are on the move, it seems. I suppose this shouldn’t come as a surprise. Card Kingdom has had some of these cards on their hotlist for a while now, and the numbers always impressed me. After all, these cards aren’t tournament playable. Then again, neither are Collectors’ Edition cards and those have all gone through the roof. Are these prices real, though? I mean, isn’t black-bordered Decree of Justice worth far less than the $9 cited for the gold-bordered version above? Are these cards due for another surge? Maybe this is how frustrations with Wizards’s reprint policy is manifesting itself, and prices will continue to climb upwards? This week I want to do a deeper dive to see if I can uncover any insights into this once-forgotten group of cards. If you only care about the finance portion of this article, feel free to skip this section. I suspect many readers won’t know where these gold-bordered cards came from (or even about their existence). 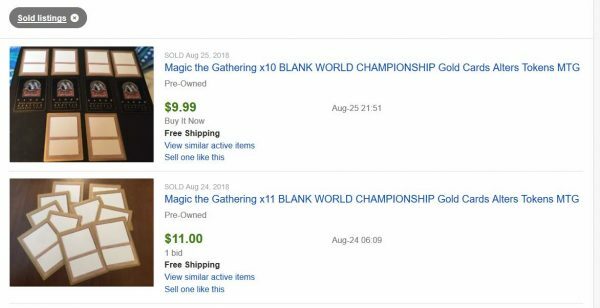 According to the MTG Wiki, “World Championship Decks were specially packaged versions of four of the top ranked decks used during World Championships, released by Wizards of the Coast for the years 1997-2004.” All the cards were gold-bordered and not legal for tournament play. But otherwise they look and feel like a regular Magic card. The date range above is very compelling for two reasons. First, the span of eight years tells me the diversity of gold-bordered cards that must exist will be wide. The cards played in World Championships Seattle in 1997 must look very different from the ones played in 2004 in San Francisco. And second, cards like these haven’t been printed in over a decade. We all know how rare cards are from the early 2000s relative to today’s print runs, and I’m confident these were printed in limited numbers to begin with. While print runs aren’t available, we can judge relative rarity by exploring which desirable cards show up in more than one deck and which do not. For example, Gaea’s Cradle—the most valuable gold-bordered card—shows up in only one deck: Matt Linde’s Mono-Green Stompy list from 1999. Perhaps it wouldn’t be a $50+ card if the card was played as in other lists. At least the deck ran the full playset. The last thing worth mentioning as background is the decision to discontinue World Championship Decks. The reason cited: the introduction of the Fat Pack “gobbled up” demand for these preconstructed decks. The demand just wasn’t strong enough—this is another data point to suggest this set’s limited run. Clearly, Gaea’s Cradle is the king of gold-bordered cards by a wide margin. But it should be obvious why: it’s a highly desirable card for Commander (often, an unsanctioned format) and its black-bordered counterpart is a small fortune! In fact, you can say the same for the rest of that list. Well, maybe besides Arcbound Ravager. That one is in just 800 EDH REC lists—I honestly don’t know why that one stands out, since its value is driven mostly from Modern. But the rest of the cards on the above list all make sense. When playing EDH, gold-bordered cards are more likely to be tolerated by your local play group. Four of the six cards above are also on the Reserved List, so the prospect of finding cheaper copies of these cards is grim. These cards are perfect alternatives to improving your Commander deck’s power level without breaking the bank. No wonder there’s a reasonable demand profile for them! In fact, some of the cards that just barely fall short of that $10 mark also fall into the same category: Yawgmoth’s Will and Survival of the Fittest come to mind. Both Reserved List, both have expensive black-bordered counterparts, both are useful in Commander. With the Reserved List here to stay, hopefully you are as convinced as I am that these are worthwhile cards to shop for, or at least to be aware of. At this moment, I own zero gold-bordered cards—historically I’ve avoided these for their lack of tournament legality. But I am starting to come around as I seek out cheaper ways to enjoy my favorite game. Even those not on the Reserved List aren’t all that vulnerable to reprint unless those reprints drive prices into the ground. Force of Will: This card was reprinted not long ago, but black-bordered copies are still pretty expensive. A gold-bordered copy is the perfect discount alternative for a budget EDH deck. Grim Monolith: Reserved List, popular in Commander, expensive black-bordered counterpart. All three boxes checked—I’m surprised this one isn’t more expensive already! Metalworker: Not quite as popular as Grim Monolith, but Reserved List all the same. The black-bordered version isn’t going to get cheaper, so the gold-border printing’s trajectory should be upward. Flooded Strand: There are three fetchlands in these sets, and this is the only blue one. Its ubiquity in multiple formats should give players plenty of opportunity to find use for it, even if gold-bordered and reprintable. City of Brass: Here’s my penny-stock pick, as it only buylists for a buck currently. Make sure you get the Seattle 1998 version, which uses the original art. I would be fine playing this version in Old School—even Chronicles versions are getting costly, so this is the next option if you want to stick to the old art. I want to mention two more things about these before wrapping up. First, you could always buy the decks in their complete form if you want access to a bunch of these cards at once. In their sealed form, they have collector demand also going for them. But you also have the option to crack for singles. Just make sure you research which decks you want based on the cards within them. TCGplayer is nearly devoid of these sealed decks, unfortunately, but I’m sure you could find some elsewhere. eBay has some, and perhaps even some retailers are sitting on them. I bet they wouldn’t mind moving them either since these had been fairly undesirable for many years. Once forgotten, the World Championship Decks may finally merit a closer look now. I used to ignore gold-bordered cards for their illegality in tournaments. But in a world where players are fed up with tournament play and the Reserved List, perhaps these will start to see more demand. It happened with Collectors’ Edition cards and I could certainly see these getting a bump next. A small number of these cards are already worth more than ten bucks, but that’s still a far cry from their black-bordered counterparts. As cards like Grim Monolith and Yawgmoth’s Will get more expensive, these gold-bordered versions should follow suit. Those that are Commander-playable are especially attractive since that’s a very likely avenue to use these cards. Cubes are another way gold-bordered cards can see play since those also do not rely on DCI sanctioning. I’d highly recommend browsing your local shops, secret online stores, and other venues where you make your purchases. Perhaps you can find some underpriced copies, maybe even below buylist. Since these had been undesirable for many years, stores may be willing to cut you a deal if you take a bunch at once. Lastly, don’t ignore sealed decks. Perhaps their value when broken into singles would exceed your purchase price—another avenue to make a little money. Or keep them sealed for a while. They are a piece of history, after all, and it’s highly unlikely Wizards ever makes these again. That makes for a juicy investment if you ask me! I noticed Judge Promo Intuition pop up on Card Kingdom’s hotlist just this past week. Now their buylist is $175, and really there’s no ceiling for this Reserved List foil. Keep an eye on this one! There are a few Expeditions on Card Kingdom’s hotlist now. Are these getting some attention again? Notables include Misty Rainforest ($175), Steam Vents ($85), and Watery Grave ($80). These had floundered for a while but we all know the hype around these “modern-day Reserved List” cards. After dropping all the way down to $45, Card Kingdom just moved their buylist on Argivian Archaeologist back to $70. They had a bunch in stock at one point, and I wonder if someone is trying to scoop up copies aggressively. I used to have some of these, but decided to trade them into ABU Games to take advantage of the high trade credit numbers. Now I only have one copy, and $70 isn’t compelling enough for me to want to sell it. I wonder if others feel the same way? Premodern could make the judge promo Intuitions pop like crazy. If I had the cash, I’d buy up as many as I could.